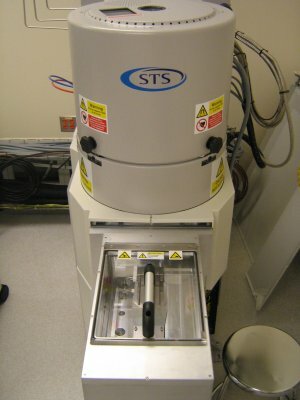 The STS Pegasus deep reactive ion etching tool is a silicon etching tool capable of over 20 microns/min etch rates (depending on loading and profile preferences) using a Bosch process. The tool has recipes that control chamber pressure, gas flows (SF6, C4F8, O2, Ar), platen temperature (-20C to 40C), coil power (3000W), platen power, and dep/etch times. 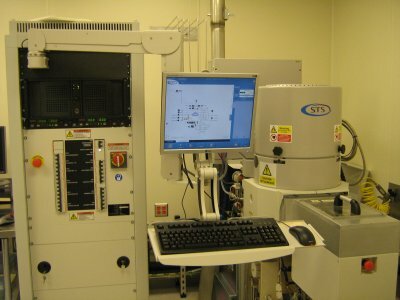 Only silicon, photoresist, and SiO2 are allowed in the chamber, but no metals are allowed. Sidewall roughness and sidewall profile are controllable with recipe development. Selectivity is high enough that thru-wafer etching is possible from one side (standard 500 micron wafer). Tooling is set for a 4-inch silicon wafer.